As we prepare for the upcoming ice fishing season, we’re reminded of just how much gear we carry out to our favorite fishing spots. Some anglers pack lightly and can throw a bag over their shoulder that will carry all they’ll need. Many anglers, however, like to pack portable shelters and other large items that would be hard to carry especially on longer distance walks. That’s why we’re taking a look at ice fishing sleds in this article. The best ice fishing sleds will give the angler the ability to pack as much as they need for a comfortable, fun day on the water. 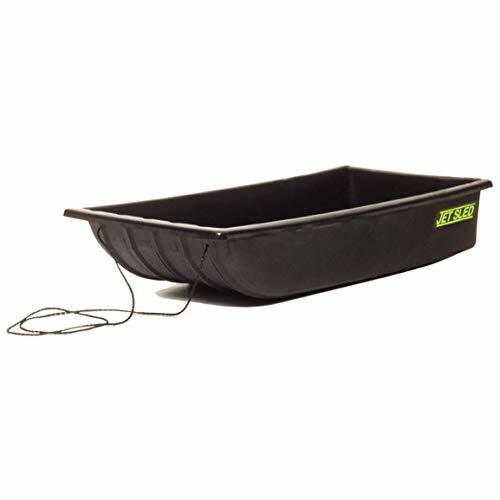 You can carry many items in an ice fishing sled which makes them attractive for all anglers. If you’re just starting out I recommend you check out our post on ice fishing equipment every angler needs to get started. You can also read about some ice fishing jigs you’re going to want in your tackle box! Just a few other things to look at as you search for the best ice fishing sled. If you’re looking to go ice fishing on your local pond maybe a couple of times and only plan to bring a tip up or two, you probably won’t need an ice fishing sled. But if you’re reading this post, my assumption is you do. Maybe you’re on a pretty sizable body of water, or you do plan on using as many tip ups as legally allowed. Or, maybe you also plan on packing a flasher and a pop-up shelter. All of this extra equipment adds weight and can make a fun day of fishing become very unpleasant. For those of you that would pack all this stuff, you’re going to want a sled. Portability – An ice fishing sled will make all your equipment much more portable. You can easily transport your stuff over ice and snow while reducing the stress on your back and legs. Convenience – Carrying all that equipment on your back can be difficult. Conveniently store your stuff on the sled and drag behind you walking or pulling from a snowmobile or four wheeler. Organization – Stay organized as you neatly pack your gear in your ice fishing sled. Rather than rifling through a duffle bag or makeshift backpack, you can easily and quickly locate everything you need in a neatly packed sled. More Room – If you’re comparing space between a backpack and a sled, it’s no contest. You can not only carry all you’ll need to actually catch fish, in an ice fishing sled you can carry flashers, shelters, heating equipment, chairs, and many other items to really make your day a fun one. Take inventory as to what you’ll need on the ice. Think about what you have and what you want. Remember, if you buy an ice fishing sled you will inevitably think of ways to fill it, so consider size as the most important factor. How much stuff will you bring? Designs are all relatively the same, but some sleds are deeper than others. Will you tie down most of your stuff? You can buy a sled that’s more shallow and maybe a wider surface if you plan on tying everything down securely to the sled. If not, you’ll need a deeper ice fishing sled to ensure while you’re walking (or towing) that sled to your spot your gear doesn’t Hansel and Gretel a trail for you back to your truck. Is the sled quality or not? Most ice fishing sleds are merely molded plastic with a few ridges in it. Some sleds are reinforced with runners and other hardware for various purposes. Some ice fishing sleds are built with chair brackets so anglers can sit in the sled while fishing. Figure out exactly what you want from the sled. Do you just want something to carry your stuff for you or do you want something more? Do you need a lot of space or only enough to carry a few bigger items? Would it make sense to modify the sled to tailor to your needs or is there a great ice fishing sled that serves you well right out of the box? The consensus is the Jet Sled is your best ice fishing sled. Well reviewed, well liked, and it seems to be the brand everyone talks about when they talk about ice fishing sleds. The 54 inch model, known as the JS1, is your standard sized, all around, multi-purpose sled. Polyethylene construction makes this sled as rugged as they come. Specially molded runners assist in durability and performance when pulled. With 54 x 24 inch dimensions, you can pack quite a bit of gear and still have lots of room left. 10 inch sidewalls gives you plenty of volume. They say you can use this sled for dragging deer from the woods. I believe it. Well constructed and tough enough to not only be dragged smoothly on the ice but also in tough terrain in the woods. Shappell offers the Jet Sled in several sizes and shapes but this one fits just about every need. If you’re looking for the best ice fishing sled on the market, this is the one. Amazon previously picked the Terrain Sled as their choice when buying an ice fishing sled. It’s dimensions are 54 x 26 inches making it slightly wider than the Jet Sled, but only 9.5″ tall making it slightly less deep. The sled has nice grooved runners for easy gliding on the snow and ice and a few other ridges molded out for brackets and other ice fishing sled modifications. Even with the increased space, the Terrain Sled only weighs 12 pounds so you won’t feel like you’re dragging a boulder behind you. This sled also comes with a two year warranty which makes it an attractive option for conscientious buyers. If the sled breaks, cracks, or splits due to a defect you’re covered by a nice two year warranty. You can’t really complain about that! The Terrain Sled is priced competitively and should be absolutely considered a fine option. You might not really need a substantially large sled. Maybe you’re fishing solo and don’t need some of the larger items or you pack lighter than other anglers. If that’s the case, check out the small Beavertail Sled. These sleds are marsh brown, made from 100% virgin polyethylene and are as rugged as they come. Bottom reinforcing runners make this sled glide smoothly on the snow and ice. The dimensions on this sled are a tad smaller than the others mentioned, coming it at 44 x 22 inches with a 9 inch depth. You’re losing around ten inches in length but you’re shaving half the weight as this sled weighs only 6 pounds. That’s like pulling a feather! Aggressively designed to cut through snowbanks and other debris, this sled will follow you with little resistance as you work your way to your favorite spot. 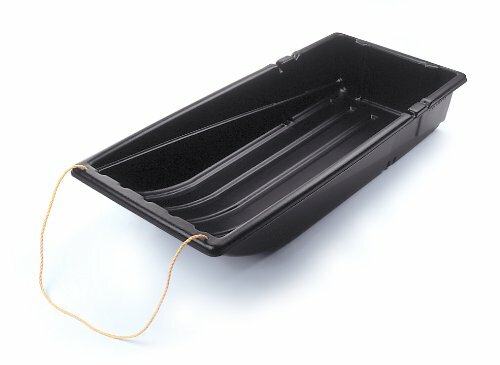 As with all the ice fishing sleds mentioned, this one will work well in all conditions and is designed for bitter colds and sweltering heats. This one is a little pricey but may be the right size for the job. Check it out! You can’t really go wrong with any of those choices mentioned already, but if you’re looking anything bigger, check out the Jet Sled XL. Measuring 66 x 31 inches, this monster of a sled will carry everything you need and then some. This is a great option so long as you’re pulling it with something powered. I wouldn’t recommend grabbing this ice fishing sled unless you’re using a snowmobile or four wheeler. At 21 pounds, you will be feeling it after pulling for awhile. But, again, if you need something that will carry everything you could possibly need for a trip on the ice, this is the sled. If you do find yourself picking up one of the fine sleds from Jet Sled, you should consider covering your items in this really nice ice fishing sled cover. It does a terrific job of keeping your gear out of the elements, nice and dry. The elastic hem is form fitted for your Jet Sled and keeps out the slush, rain and snow when traveling or fishing. This cover is made from 600 denier polyester so you can feel confident it’s tough. As mentioned before, you cannot go wrong with either choice. For brand name recognition, the Jet Sled is your most popular. Amazon likes the Terrain Sled and for good reason. 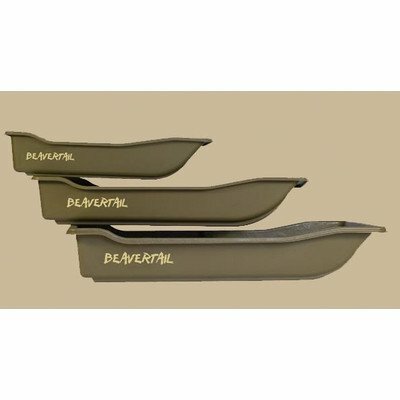 If you’d like something smaller but still require the durability and good construction, take a look at the Beavertail Sled. All three choices will get your gear safely and securely to where you need them to go. All three are designed for ease of pulling so you can walk your stuff to your favorite spot without feeling like you’re fighting the snow and ice at your feet. Plus, all three have reinforced runners to help your gear glide through what you’re pulling over. And, maybe most importantly, all three are built with lightweight design to prevent fatigue over prolonged usage on a day out. You should just think about ice fishing when you go out, not how tired you are from pulling your gear. These ice fishing sleds do a terrific job making it easy for you to have a fun day out on the hard water. Find the right ice fishing sled for your needs and get out and catch some fish! What Is The Best Ice Auger For Fishing? Here Are The Best Ice Fishing Lines For You To Take On Your Next Ice Fishing Trip! Sufix 832 Advanced Superline Review – The Best Braided Fishing Line?